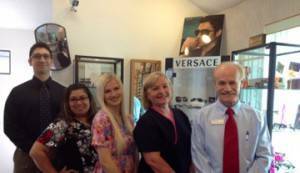 The eye doctors at Austin Eyecare believe in looking at the big picture when it comes to your eye health, so we take the time to get to know you, your eye care history and your vision needs. Our doctors know that getting the right prescription involves balancing several factors, including clear eyesight, visual efficiency and your ability to process visual information seamlessly. Whether you need a routine eye examination, an eyeglass fitting, contact lenses, treatment for eye disease (such as glaucoma, macular degeneration or dry eye syndrome) or LASIK preop and postop care, our doctors will provide you with the best care, advice, options and follow up. Our doctors, who have been serving the Austin area for over 28 years, are optometrists you can trust. Please take advantage of our expertise by scheduling your exam today with Austin Eyecare at 512-443-4317. They are very thorough and check everything! Pleasant, professional staff. Dr. Duke has a kind, gentle manner. They are very thorough and check everything! Everything about this office is great! Dr. Duke was fantastic. He was professional, thorough, showed genuine concern for my well being and was open and honest about my options. I found him through my insurance and was able to make an appointment 3 days later. His office is clean and everyone is friendly and there was no waiting at all once I arrived. Everything about this office is great! She is professional, knowledgeable, and is a very kind person. I would highly recommend this location for your eye care needs. I was helped immediately when I walked in although I was 10 min early. The location had kind staff and a clean and sanitary environment. Dr. Desai completed my eye exam and she is an excellent optometrist. She is professional, extremely good at her job, knowledgeable, and is a very kind person. Phenomenal customer service! I will recommend to everyone!